Sheet flooring is changing its image big time. No longer dull and dingy-looking, linoleum and vinyl floor coverings now come in bright modern patterns, for a fresh new look. These materials do require some special treatment during installation, though, so be sure that you avoid these 12 linoleum and vinyl flooring installation mistakes. Thinking that all sheet flooring is linoleum. DO IT RIGHT: Learn the difference between linoleum and sheet vinyl flooring. "Linoleum" is a natural product made from linseed (flax seed) oil, blended with fillers like wood flour, rosin, and cork dust. When installed, linoleum must be sealed against water penetration. 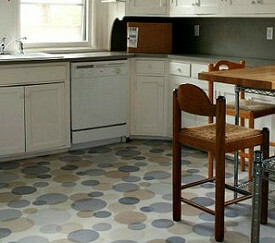 Vinyl flooring is manufactured from petroleum and is highly moisture proof. Failing to measure and cut extremely precisely. Though linoleum and sheet vinyl flooring are appealing and affordable (cost to install vinyl or linoleum by a flooring professional is approximately half that of tiles and one-third the price of hardwood), they do not allow nearly as much margin for error as a pieced floor. DO IT RIGHT: Take the dimensions of the area to be covered before you order your vinyl flooring. Then measure again prior to making even a single cut in your material. Installing your flooring right after purchase. DO IT RIGHT: Leave sensitive vinyl and linoleum floor materials alone for 24 hours post delivery, so they can acclimate to the temperature of your home. Trying to save time by not making a template of the floor. DO IT RIGHT: Use sturdy felt paper, taping pieces together to form an accurate whole-room template so that you can cut your flooring correctly. Tearing up the old floor. DO IT RIGHT: It's fine -- not to mention time-saving -- to install linoleum or a vinyl floor right on top of the existing material, as long as it is clean, dry, and level. The additional thickness will be relatively small; trim the bottom of the door if you need a little additional clearance. Leaving the baseboard moldings in place during the installation. DO IT RIGHT: For nice, neat results, remove the moldings, as well as the door threshold, before you lay the sheet flooring. Not bothering to read the manufacturer's instructions on your sheet flooring adhesive. DO IT RIGHT: Make sure that you understand the process. Wear a breathing mask or respirator and ensure the room is well ventilated, if the directions specify. Being sloppy while you're applying the glue. DO IT RIGHT: Spread a smooth, even layer and take care to get the glue into every corner of the room. Not allowing enough "open time" between applying adhesive and placing the sheet flooring material. DO IT RIGHT: Follow the directions to avoid bubbling of the glue. Delaying the cleanup of excess glue. If allowed to dry, sheet flooring adhesive will require a solvent for removal. DO IT RIGHT: Keep warm water and a cleaning cloth close at hand for this purpose. Neglecting to use a roller to smooth out the linoleum or vinyl flooring after you've glued it in place. DO IT RIGHT: Roll the floor, starting from the center outward, with a rented floor roller -- or even a kitchen rolling pin for small areas. Treating your carefully installed vinyl or linoleum floor roughly in the future. DO IT RIGHT: Take off your high heels or cleats before walking on your beautiful new flooring, and protect it from dents and scuffs with furniture pads on the legs of your chairs and tables.